Matthew Bendo is a Canadian cinematographer. He was born April 11, 1992 in Windsor, Ontario. Bendo is best known for his work on the Lamborghini commercial entitled “Storm”. Bendo is currently based out of Toronto, Ontario, where he works as a freelance cinematographer. Bendo’s love for cinema began during his time as a high school student at St. Anne’s in Windsor, where he developed an interest in animation. After completing high school, Bendo studied at the University of Windsor. While at the University of Windsor, he was given a Board of Governors medal awarded to those students with the highest academic average in their class. At the age of 18, Bendo (along with his friend K. J. Proulx) created an anti-bullying video entitled “Pull the Plug on Bullying” as a part of a video contest hosted by the Internet security company Trend Micro. Bendo has received a great deal of recognition and praise for his work as a cinematographer. He has extensive experience working with many high-profile companies including Coca-Cola, Microsoft, Honda, Disney Channel, Canadian Living, and Sunwing Airlines. 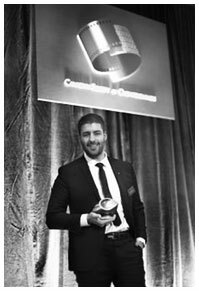 His work on the Lamborghini commercial “Storm” earned him a nomination (and a win) for Best Cinematography from the Canadian Society of Cinematographers in 2017. Bendo worked on the commercial with Tony Lau, one of Bendo’s former instructors at the University of Windsor, and Cal Cuffaro, who worked on sound design. He co-directed the commercial with Cameron Bryson. About Matt Bendo. (n.d.). Matt Bendo Cinema. Caton, M. (2017, Mar 31). Local cinematographer Bendo up for award for web commercial. The Windsor Star. Grad comes out on top at national film awards gala. (2017). University of Windsor Daily News. Hill, S. (2010, Nov 15). Pair’s anti-bullying video to play in times square. The Windsor Star. Matt Bendo. (n.d.). Internet Movie Database. Square Staff. (2017). Windsor’ s Bendo hopeful for award. The Square.